Whatever your views on wind power, and turbines, and the siting of same, you’ll want to check out the draft environmental impact statement for the Whistling Ridge Energy Project. And share your thoughts, at either of two public hearings this next week. From 6:30 to 9:30 p.m. Wednesday, June 16, public comment will be taken by the Washington Energy Facility Site Evaluation Council at the Underwood Community Creek Center of the Skamania County Fairgrounds in Stevenson. It’s at 710 SW Rock Creek Drive. Of course, it might help if you knew what you were talking about. To prepare, you can find your homework reading assignment right here. The shorthand versions is this. 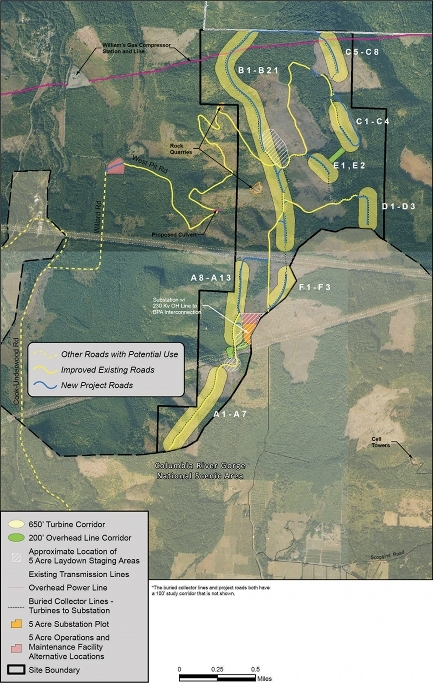 SDS LLC, which owns and manages more than 70,000 acres of land, larger for timber production, in Washington and Oregon, has created Whistling Ridge Energy LLC to pursue permitting and, with approval, develop the project. Whistling Ridge Energy is proposing to put up to 50 wind turbines that would generate 1.2 to 2.5 megawatts each, over 1,152 acres on Saddleback Mountain — starting just north of the boundary of the Columbia Gorge National Scenic Area and extending northward. The site is about 7 miles northwest of the town of White Salmon, essentially on the western ridge flanking the White Salmon River valley. Each turbine would be up to 262 feet tall, base to hub. From base to the top of a blade at full vertical extension would be about 426 feet. Construction would take 15 months, and employ up to 330 people. After startup, the project would employ eight or nine operations and maintenance people. Copies of the Whistling Ridge Wind Energy Project Draft EIS will be available for Public Reference at the following locations.